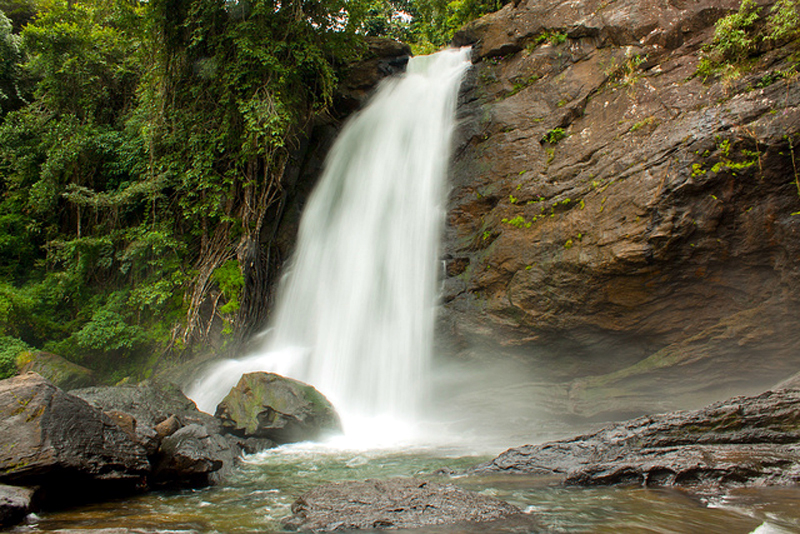 Soochipara Waterfalls is located in Vellarimala, Wayanad. It is surrounded by Wet Evergreen and Tropical Montane Forests. Another name of Soochipara Waterfalls is Sentinel Rock Waterfalls and is a three tier waterfalls with a spectacular view. Soochipara Waterfalls is located at distance of 24km from Kalpetta, via Meppadi Rd and Meppadi- Chooralmala Rd. The drive will take around 1 hr to reach Soochipara. The name Soochipara comes from the local Malayalam language words Soochi(needle) and Para(rock) because the water is flowing through a needle-shaped rock. This is situated at a height of 200 m above sea level and thus you can enjoy the scenic beauty of tea estates in Wayanad. The waterfall makes a pool beneath it where you can enjoy bathing. You have to park your vehicles at the parking area and from there you need to walk 2 km to reach the waterfalls.At the parking area, a security check is there for you to ensure you are not carrying any plastic. If you want to carry a plastic bottle with water, you can tag it and pay Rs. 50 per bottle as a deposit. This amount will be refunded once you are back and show them the tag. Entry ticket is also issued and it costs Rs. 80 per person and Rs.40 per camera. In order to keep the place clean and free from plastic, food is also not allowed to carry beyond the checking counter. We recommend you to visit Soochipara Waterfalls during Monsoon.